Sabre combines control with identification in this tiny package. The Sabre Red H2O MK-8 Key Chain Stream Spray .69 oz contains a 10% OC solution with 2,000,000 units of Scoville Heat (SHU) resulting in 1.33% major capsaicinoids spray, the maximum level on the market. This water based spray formula has been tested for quality via High Pressure Liquid Chromatograph (HPLC) test. Sabre's Red H2O is non-flammable so it can be used in conjunction with ESD. The H2O stream sprays are easier to clean up, making decontamination faster. Sabre Red MK-8 is propelled via nitrogen so it won't freeze and will work in all temperatures. This key chain model also includes an ultraviolet dye, so if your suspect flees after being sprayed, their clothes will give them away. Please note that pepper sprays can only be shipped to continental US street addresses via ground service (no shipping to PO Boxes, non-continental states, or Canada). Prefect size to carry in your key chain. 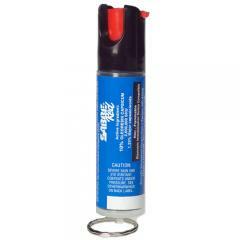 10% PepperGel Home Defense Spray 11.64 oz.